The chemistry of complex compounds of transition metals with multidentate ligands, which simultaneously contain several donor atoms, is not only theoretical but also of practical interest, since in addition to the unusual properties of such complexes, the structure and types of binding of multidentate ligands with different metals give a new impetus to the development coordination chemistry as a whole. Among the coordination compounds, the complexes obtained on the basis of biomaterials take a special place. This is due to the fact that they play an important role in many biochemical processes and therefore are widely used in plant growing, animal husbandry, and pharmacology. In turn, the study of the properties and structure of coordination compounds of metal ions with organic ligands containing various donor centers was an important factor in the development of new approaches to their physic-chemical research [1-3]. On the other hand, complex compounds of many transition elements can possess a wide range of useful properties, for which the chemistry of complex compounds has not yet been sufficiently studied . In this paper, we present methods of synthesis and study of the properties of manganese (II), copper (II), cobalt (II) and zinc (II) complexes with ligand (tryptophan). The composition and chemical structure of the synthesis products obtained are studied by physical-chemical analysis methods: elemental analysis (İCP-MS); X-ray phase analysis (diffractometer (Germany) D-2 Phaser firm Bruker); IR spectroscopy ("Specord M-80" brand Carl Zeiss). The spectra of the reaction solutions in the IR and UV regions were recorded on the Nicolet IS10 spectrometer and the Evolution 60S spectrophotometer, manufactured by Thermo Scientific Spectronic (USA). Differential thermogravimetric analysis was performed on (NETZSCH STA 449F3 STA449FSA-0622-M). A sample of 0.85 g (0.005 mole)-CuCl2 2H2O was dissolved in a two-necked flask under reflux in 30 ml of ethyl alcohol at a temperature of 60°C, and 2.04 g (0.001 mole) of ligand L-tryptophan-(in a molar ratio of 1: 2) previously dissolved in 20 ml of ethyl alcohol . The resulting mixture was heated for 2 hours, then cooled to room temperature, filtered and put on crystallization. The beige-colored crystals were filtered, washed several times with the mother liquor, then 15-20 ml with acetone and dried in a desiccator over sulfuric acid until a constant weight was established. A beige color solution obtained by dissolving 0.65 g (0.005 mole)-Zn powder in 20 ml of ethyl alcohol, 2.04 g (0.01 mole) of ligand L-tryptophan dissolved in 30 ml of ethyl alcohol (in a molar ratio 1: 1). The solution was heated for 2-2.5 hours at a temperature of 60°C. Further, the synthesis process was carried out according to the above described procedure. According to the above procedures, 2.04 g (0.01 mol) of ligand L-tryptophan (molar ratio 1: 1), previously dissolved in 20 ml of ethyl alcohol, was added to 1.62 g (0.01 mole)-MnCl2 •2H2O dissolved in 20 ml of ethyl alcohol. The resulting mixture was heated for 2 hours, then cooled to room temperature, filtered, washed several times with the mother liquor, then 10-15 ml with acetone and dried in a desiccator over sulfuric acid until a constant weight was established. According to the above procedures, 2.04 g (0.01 mol) of ligand L-tryptophan (molar ratio 1: 1), previously dissolved in 30 ml of ethyl alcohol, was added to 2.35 g (0.01 mole) –CoCl2 •6H2O dissolved in 20 ml of ethyl alcohol. The resulting mixture was heated for 2 hours [6,7], then cooled to room temperature, filtered, washed several times with the mother liquor, then 20-25 ml with acetone and dried in a desiccator over sulfuric acid until a constant weight was established. The elemental analysis data of the metal-ligand complexes are pointed up in TABLE 1. Table 1: Elemental analysis results of the complexes. 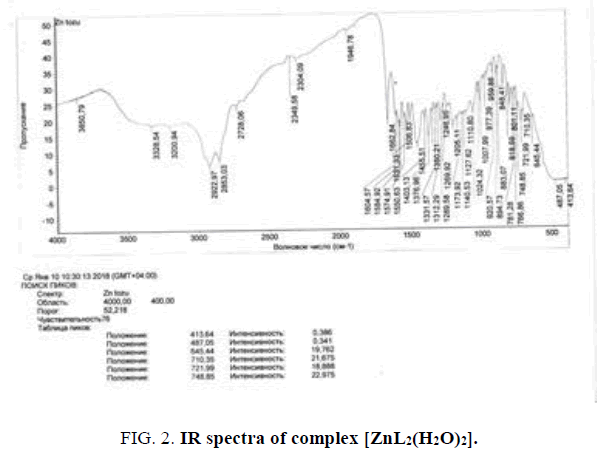 To determine the coordination character of the synthesized complex compounds formed between the ligand and the zinc, IR spectroscopic analysis was carried out (FIG. 1). Figure 1: IR spectra of tryptophan. In the region of νNH=3408.37 cm-1 of the tryptophan molecule, the absorption band of the valence vibration of the NH bond of the double amino group in the indole ring is observed. In the vNH=3038 cm-1 region of the NH3+ band, the valence vibration of the NH bond and the valence vibration of the aromatic rings overlap (FIG. 2). Vibrations the asymmetric valence of the C=O bond in the COO- ion is observed at 1663 cm-1. This testifies that, the tryptophan molecule is free for fast ion. 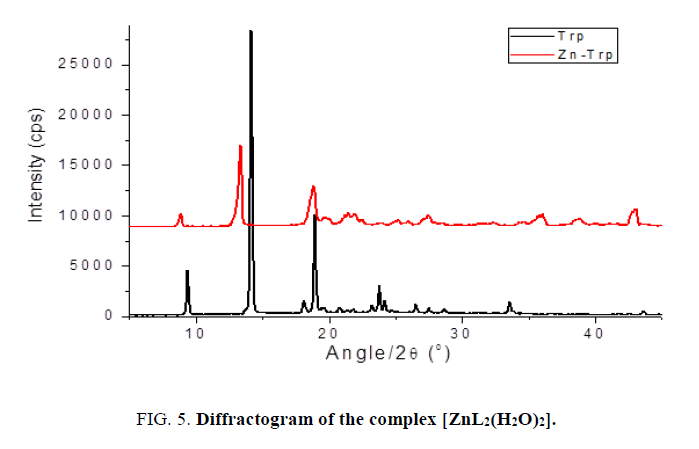 Figure 2: IR spectra of complex [ZnL2(H2O)2]. When the IR spectra of the free ligand are aligned with the spectra of the complexes obtained, an obvious change is observed. In the reaction of zinc with a tryptophan molecule, the double absorption bands of amine NH tryptophan νNH=3402, 73 cm-1 and δNH=738.16 cm-1 disappear. A comparative analysis of the results of IR spectral analysis shows that a crystalline complex of the ionic type of tryptophan and Zn is synthesized. In the ligand spectra the ν(N-H) stretching vibration appears at 3038 cm-1 and is shifted at 3229 cm-1 and 3172 cm-1 in the Cu (II), and Co (II) spectra. The absorption band at 1663 cm-1 in the ligand spectrum was attributed to the ν(C=O) stretching vibration is shifted toward higher wave numbers in the complexes 1 and 2 spectra, which involves the carboxylic group in the covalent bonding to the metal ion. The ν(OH) stretching vibrations do not emerge in the ligand spectra, but they appear in the complexes spectra at values between 3383 to 3449 cm-1, suggesting the presence of the crystallization water within these complexes (FIG. 3). Figure 3: Thermogravigram of complex [ ZnL2(H2O)2]. With the definition of the thermic stability and the composition of synthesized complexes [ZnL2(H2O)2] the thermographic analysis was made. 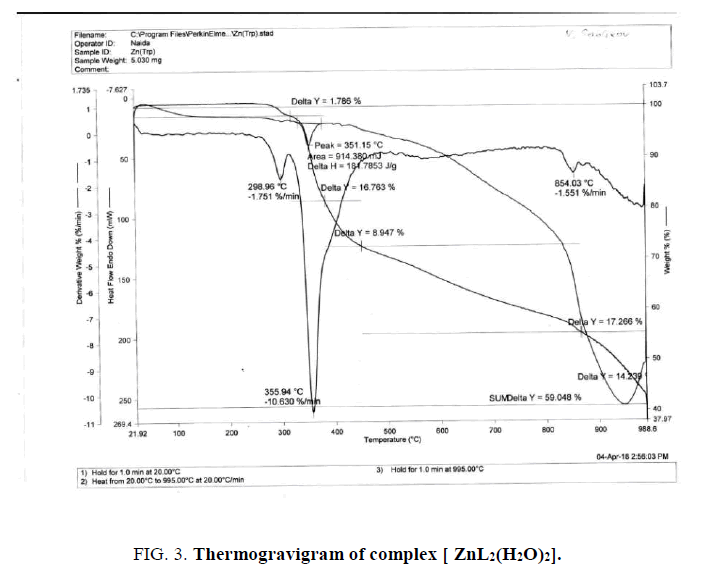 Thermocouples were used to determine the composition and durability of the synthesized complex compound and it was established that the complex is resistant to a temperature 298°C (FIG. 4). At higher temperatures, the complex gradually breaks down, and this process ends in several stages, and in all cases the final product of the thermolysis process consists of metal oxides. Thus, according to the results of the physicochemical methods used in the work, it is established that the composition and structure of the complexes obtained directly depends on the ratio of the initial products. 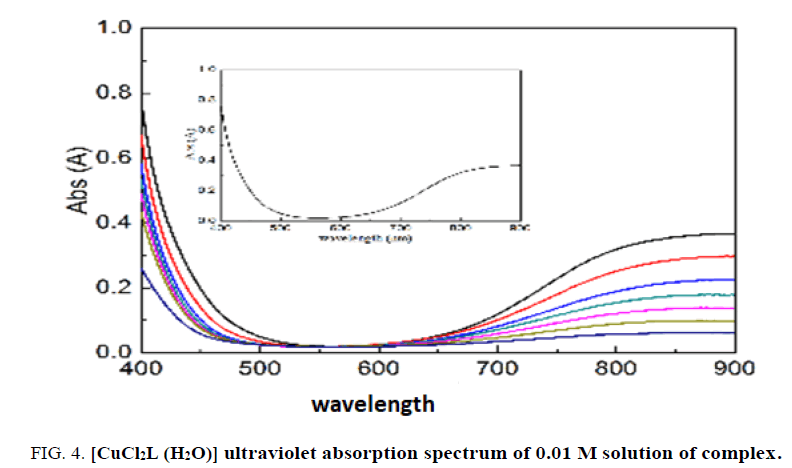 Figure 4: [CuCl2L (H2O)] ultraviolet absorption spectrum of 0.01 M solution of complex. The UV-VIS spectroscopu analysis of 0.01 M of [CuCl2L2] 2H2O complex is water was made. It is clear from the specimen that the d-d passage is 590-620 nm wavelength. FIG. 5. shows the result of X-ray phase analysis of the synthesis product. The interpretation of the obtained data also confirms the formation of the [ZnL2(H2O)2] complex. Figure 5: Diffractogram of the complex [ZnL2(H2O)2]. Since the parameters of the crystalline cell differ from each other, a coordination complex Zn-tryptophan was created (FİG. 6). Tryptophan peaks did not appear in Zn-tryptophan, but almost all complexes were created. 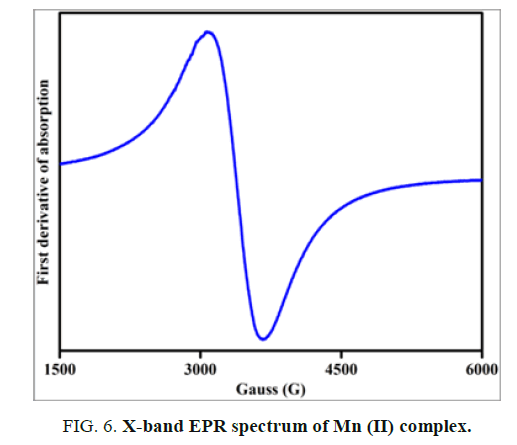 Figure 6: X-band EPR spectrum of Mn (II) complex. The X-band EPR spectrum of Mn (II) complex is obtained at room temperature for the polycrystalline sample and is shown in FIG. 6. The EPR spectrum exhibits a broad signal without fine or hyperfine structure. The effective g value is found to be 2.04. This signal suggests that dipolar interactions between manganese ions exist. Mn (II) ions belongs to 3d5 electron configuration for 55Mn nucleus, the nuclear spin I=5/2 and hence EPR spectrum of Mn (II) complex at room temperature exhibits a characteristic six-line hyperfine splitting. If the symmetry around Mn (II) is distorted due to complexation, the resonances become anisotropic and a randomly oriented sample may exhibit a broad line. The observed broad signal in the present work suggests that the symmetry around Mn (II) ion in the complex is distorted one. To determine the composition and thermal stability of the complexes under study, we performed elemental analysis, IR, UV-VIS and EPR spectral and thermogravimetric analysis. The results of the investigations showed that in all cases the final product of the thermal decomposition of the complexes is metal oxide. Thus, according to the results of the physicochemical methods used in the work, it is established that the composition and structure of the obtained complexes directly depends on the ratio of the initial products. The energy of germination and the germination of seeds treated with zinc complexes with amino acids are determined on three-day and seven-day sprouts, respectively (TABLE 2). As can be seen from TABLE 1, the seeds treated with a complex of zinc with cysteine have high germination energy and germination. The stimulating effect of low concentrations of zinc sulphate solution on germination, germination energy, and seedling growth was noted in the works of a number of authors [5-10]. In these studies, it was noted that low concentrations of zinc sulphate exert a positive influence on the synthesis of photosynthetic pigments, while the introduction of zinc with phosphorus exhibits the opposite effect. In the authors' opinion, such a negative effect is related to the interaction between zinc and phosphorus, which ultimately leads to the phenomenon of chlorosis. Some researchers believe that with the concentration of high concentrations of zinc, phosphorus and iron in the nutrient medium, zinc digestion by the root system of plants is difficult. However, the introduction of zinc and phosphorus in low concentrations increased the growth and development of plants, and the content of chlorophyll in the leaves also increased. Hence, it was concluded that low concentrations of these elements ensure the normal development of wheat plants. The work was carried out with the financial support of the STCU project (number 6282). Gahramanova SI, Guliyeva EA, Suleymanov GZ, et al. Influence newly synthesized manganese complexes with amino acids on morphophysiological characteristics wheat germ. Am Int J of Contemporary Res. 2014;4(12):58-60. Mahmudov KT, Sutradhar M, Martins L, et al. Mn (II) and Cu (II) complexes with arylhydrazones of active methylene compounds as effective heterogeneous catalysts for solvent and additive-free microwave-assisted peroxidative oxidation of alcohols. RSC Advances International journal to further the chemical sciences. The Royal Society of Chemistry. 2015;5:25979-87. Gahramanova ShI, Guliyeva EA, Suleimanov GZ, et al. Interaction of manganese (II) with valine and ß-alanine. International Youth Scientific and Practical Conference of Students, graduate students and young. "Fundamental and applied research in the field of chemistry and ecology". 2015;29-31.
de Souza MVN. Mini-rev. Org Chem. 2006;3:155-65; b) Vogler T, Studer A. Synthesis-Stuttgart. 2008;pp:1979-93. Cao Q, Dornan LM, Rogan L, et al. Aerobic oxidation catalysis with stable radicals. Chem Commun. 2014;50:4524-43. Allen SE, Walvoord RR, Padilla-Salinas R, et al. Aerobic copper-catalyzed organic reactions. Chem Rev. 2013;113: 6234-58. Alam SM, Shereen A. Effect of different levels of Zinc and Phosphorus on growth and chlorophyll content of wheat. Asian J Plant Sci. 2002;3:304-6. Mortverdt JJ, Giordano PM. Availability to com of zinc applied with macro nutrient fertilizers. Soil Sci. 1969;108:180-7. Tayyeva H, Humid USh, Muhammad J. Zink effect on grown rate, chlorophyll, protein and mineral contents of hidroponically mungbeans plant (Vigna radiata). Arabian J Chem. 2013;pp:1-7. Viets FJ. Zn deficiency in the soil plant system. C. Thomas publisher. Springfield, USA. 1966;pp:90-127.